When the Niche Award finalists were posted, I tallied ten polymer clay nominees in five categories including Teapots and Fiber! I’m sure that’s a record. The photos on the list on Niche’s site are frustratingly small. Guess we’ll have to wait to see them up close. And our rumor mill missed Wiwat Kamolpornwijit’s entry. (He just sent this photo.) Read about Wiwat on this site as well as on his personal pages. Thanks to Janice Abarbanel for spotting the Niche news. The metalsmiths now have their own IPhone app, iMakeJewelry, thanks to Victoria Lansford. Can an app for polymer folks be far behind? Thanksgiving tip: Those turkey baking bags come in handy for baking polymer clay in your home oven in a pinch. No mess, no smell, no oily residue. Thanks for the bag tip Cynthia! Better to bake clay than turkey! Love it. Just got off the phone to congratulate Wiwat. He told me about his new design that included some canes he learn how to make this year. He will be at the American Craft Council show again in Baltimore. If you are going to Synergy II, look him up. Nice works and nice guy. Wow – Mr Kamolpornwijit is in very elevated company, and deservedly so. Thanks Cynthia for the link to Niche. They’re only small in size. The art work is outstanding. Wish I could see it in person. Wiwat’s work is very original and I love the power of color he brought to it. 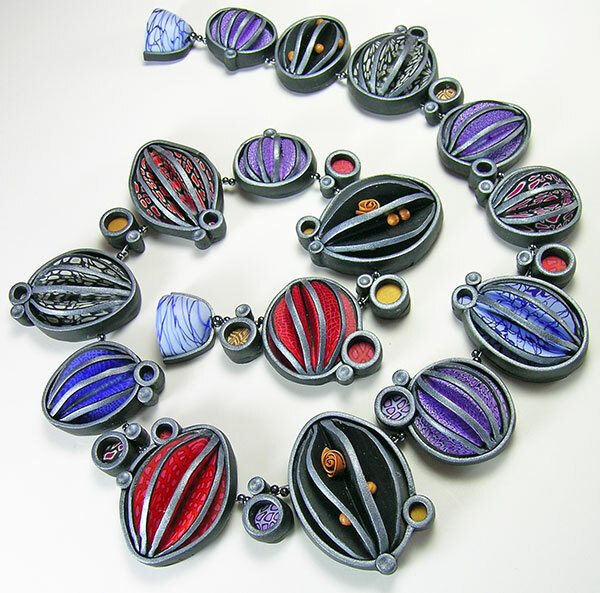 I had seen some of his recent work in Art Jewelry and was enthralled—would love to see more of it! I hear he has some pieces in a gallery downtown–will check it out.